Hat tip local Facebook page. This is going to be a project for Forest Gate North Labour Party. 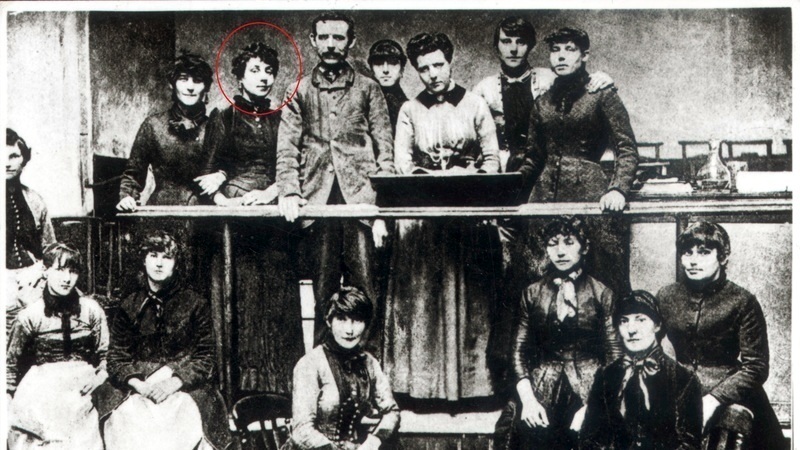 Sarah Chapman was a leading member of the 1888 Matchwomen’s Strike Committee (pictured above). Sarah (ringed) is standing to the right of Herbert Burrows and Annie Besant, the Socialist Reformers. Sarah went on to become one of the first working-class women to represent their Union at the TUC. With burial space running out in London, cemeteries are looking at ways to reclaim land and at Manor Park they do this by ‘mounding over’ so that they can re-use the space. The area adjacent to Sarah is now scheduled to be mounded over and there is every possibility that this will be extended to include Sarah's grave. The Cemetery has offered a plaque elsewhere in the cemetery grounds but Sarah’s descendants feel she deserves to be remembered at the exact location of her grave. With your support we hope to place a permanent memorial to Sarah on the site of her grave. We already have parliamentary support via Lyn Brown MP and Author Louise Raw (see her Facebook page - Matchwomen Memorial @MatchwomenRemembered).